Our themes include a special section called System Status. Here you can check if the server and wordpress parameters are properly set for optimal performance. In this guide we will cover how those parameters can be set. 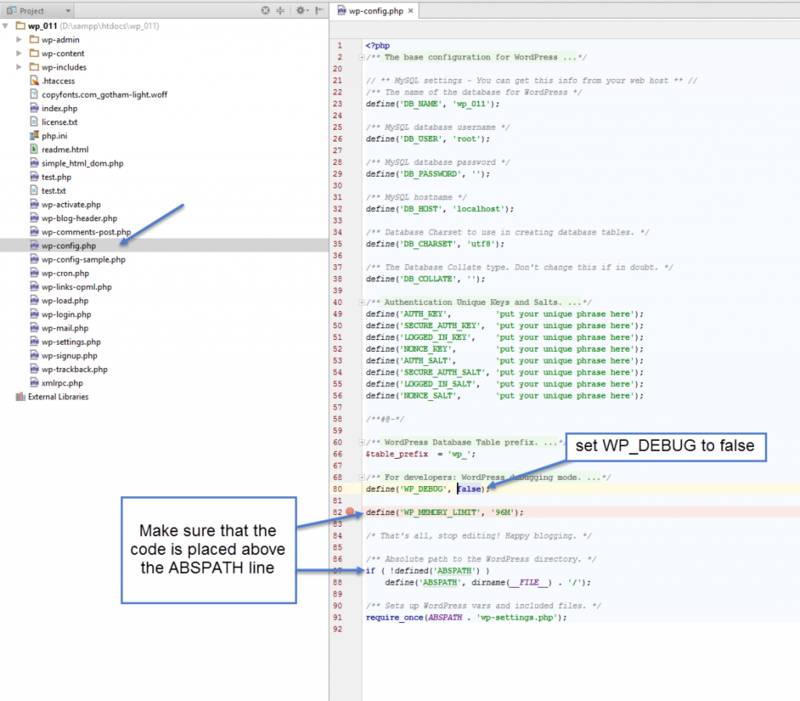 The wp-config.php file is located in the wordpress root directory. This parameter sets the amount of memory used by php and by default worpress can go up to 40MB. To avoid Memory Exhausted error this parameter should be set to at least 256MB and this can be done from wordpress wp-config.php file. It is an option intended for development, it controls the reporting of some errors and warnings. It may display unwanted messages so you should disable it on your side. The default value is false. Our theme requires that the GD Library and mbstring php extensions are enabled on the server. 2) From the select located at the top-left corner, chose the PHP version you want to use and the extensions panel will show up bellow. Press on “Set as current” button and wait until “Current PHP version” matches your selected one. Next make sure that the gd and mbstring extensions are checked. Press the “Save” button located at the bottom-left corner to save the settings. max_input_vars – This sets how many input variables may be accepted (limit is applied to $_GET, $_POST and $_COOKIE superglobal separately). By default this parameter is set to 1000 and this may cause issues when saving the menu, we recommend that you increase it to 2000 or more. max_execution_time – This sets the maximum time in seconds a script is allowed to run before it is terminated by the parser. The theme demos download images from our servers and depending on the connection speed this process may require a longer time to execute. We recommend that you should increase it 60 or more. post_max_size – Sets max size of post data allowed. This setting also affects file upload. upload_max_filesize – To upload large files, like plugins zip files, you have to increase this value also. Note – Before trying any of those check the host documentation to see what’s the recommended method. The location of the php.ini may also differ from one server to the other, usually it’s located in the wordpress root, but on some servers it may be found in another location, you have to check the host documentation for more precise details. Suhosin is an advanced protection system for PHP installations. It was designed to protect servers and users from known and unknown flaws in PHP applications and the PHP core. If it’s installed on your host you have to increase the suhosin.post.max_vars and suhosin.request.max_vars parameters to 2000 or more. Note – If Suhosin is not installed on your host you don’t have to modify these parameters.